Border-Town Factories Give Manufacturers Edge The U.S.-Mexico border region could be the key to rejuvenating manufacturing in North America. Business are betting that quick delivery times and agile, streamlined companies will have a competitive advantage over Asian firms. 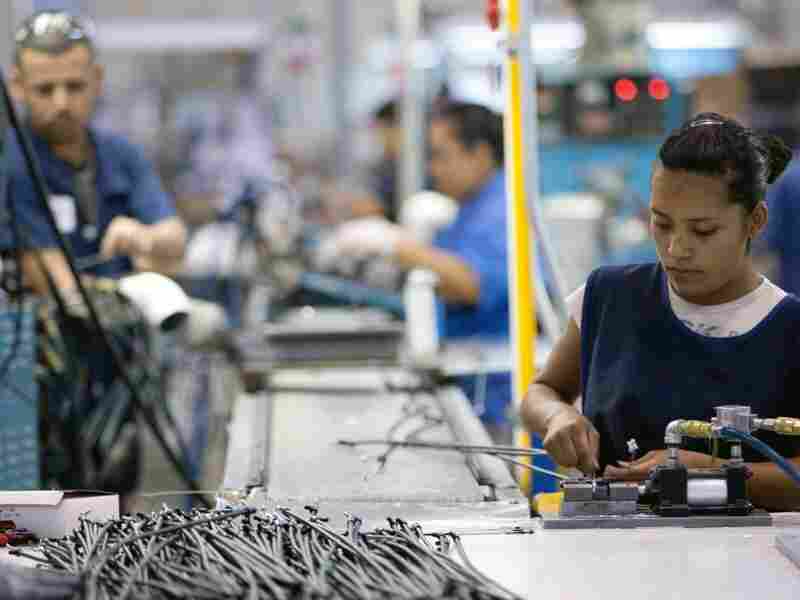 Employees of TECMA, a cross-border plant or maquiladora, work in Ciudad Juarez, Mexico. Business leaders say the quick delivery time of goods from Mexico to the U.S. can help revive manufacturing in North America. Officials in the United States have been wringing their hands lately over how to revitalize domestic manufacturing and keep factories from moving overseas. But not all of those plants are going across the ocean to China or India or some other low-cost production hub in Asia. Many are relocating just south of the border to Mexico, prompting business leaders to argue that the U.S.-Mexico border region may be the key to rejuvenating manufacturing in North America. At a factory in an industrial park in Reynosa, Mexico, just across the border from McAllen, Texas, workers make aluminum vents for heating and cooling systems. "We custom make everything. When an order comes in here, we make it to order," he says. Meyers says being just south of the U.S. border gives his company an advantage in the fiercely competitive global market. His firm gets access to a low-wage workforce in Mexico, yet it can still deliver products rapidly to their customers in the United States. His company's lead-time is just seven days, he says. Maquiladoras are duty-free factories in Mexico along the U.S. border. Raw materials can enter the maquiladoras from the United States without facing import or export taxes. Finished products then leave the factories and enter the U.S. again without being taxed by either country. They are sometimes referred to as "assembly plants" because much of what they do is assemble parts that come from around the world into finished products, primarily for the U.S. market. The maquiladora program began in the mid-1960s. Early on, they were involved in textiles. Over the years, they have expanded into different kinds of industrial production. The end products, however, tend to be components or finished consumer goods rather than raw materials. Many of the largest auto parts makers use maquiladoras. Now the factories are involved in producing flat-screen televisions, cell phones, home appliances and medical equipment, among other products. There are roughly 3,000 maquiladoras stretched along the U.S. border from Tijuana to Matamoros on the Gulf Coast. When running at capacity they employ roughly 1 million Mexican workers. Starting pay in the maquiladoras is roughly $10 per day, or about twice the Mexican minimum wage. Nonetheless, they still lag far behind U.S. wages. "You're not going to get something from China in seven days unless you put it on an airplane," Meyers says. "Here, we put it on a truck, and it's in. We take an order, we custom build it, we ship it out, and it's out quickly." By being close to its market, INFASA has also eliminated warehousing costs. The products leave the loading dock in Reynosa, clear customs a few miles away at the border, then are immediately shipped to the client. If a customer needs a product quickly, Meyer's team can build it, move it across to McAllen and have it on a FedEx flight within 24 hours. Myers says this is a service that manufacturers in Asia simply can't offer. Business leaders on both sides of the border say this is a model for how the region can revive manufacturing in North America. "A country cannot survive unless it produces something that the rest of the world wants, and that means manufacturing is critical," says Keith Patridge, head of the McAllen Economic Development Corporation. Patridge and other local leaders are marketing the South Rio Grande Valley — both sides of the Rio Grande — as a hub for "rapid response manufacturing." "I would say about 40 to 60 percent of our companies are in one way or another experimenting with the whole concept of rapid response manufactures," he says. "We have some companies that literally don't build a product until it's sold." Patridge and other advocates of rapid response manufacturing are betting that agile, streamlined companies based along the border will have a competitive advantage over Asian firms selling products to the U.S. market. First, North American manufacturers can avoid having large inventories locked in shipping containers crossing the Pacific Ocean. Second, labor in the Mexican border factories is cheap, starting at roughly $10 a day. Third, from the border, companies can deliver a customized product, whether that's an engraved cell phone or a custom mechanical part, to a U.S. buyer in a matter of days. "For the Americas — and I'm saying really probably for the North American and Central American market — we are ideally positioned," Patridge says. To foster manufacturing in the area, the city of McAllen is building an industrial research park. Officials say their goal is to be able to take a new product idea and move it from concept to production to the market in 30 days. They envision that the technical, administrative and design jobs could be based in Texas, while the gritty production happens just a few miles away in Mexico. Across the river, authorities say manufacturing is booming with foreign investment doubling in the first half of this year compared to 2010. Reynaldo Barrera Delgado publishes a magazine on the maquiladora industry in Mexico. He says despite the tough economic times, the maquilas in Reynosa continue to grow. However, the expansion isn't only among North American companies. Recently, Delgado says, many Korean and Taiwanese firms have been looking to invest in plants in Reynosa so that they, too, can get their products to the U.S. market faster.